These spicy, fruit-rich buns are the best way to start Easter morning. They're great warm from the oven but, given the time they take to prove, I'd make them the day before and have them toasted with butter. 1. Soak the currants, sultanas and peel in hot water for 30 minutes, then drain. 2. Dissolve the yeast in the warm milk and let sit for 10 minutes. 3. Mix the vegetable oil, sugar and egg together. 4. Combine all the dry ingredients with the soaked fruit in the bowl of a stand mixer. 5. Add the yeast mix to the sugar, oil and egg mix. Whisk, then stir this through the dry ingredients. With the dough hook attached, mix for six minutes, or until the dough is smooth and elastic. 6. Tip the dough onto a clean surface and knead a couple of times. Return to the bowl in a smooth ball and cover with cling film. Leave to rise in a warm place for an hour, or until it has doubled in size. 7. Tip the dough onto a clean surface, knock back gently and cut into 12 pieces. Press each piece into the cup of your hand and roll in a circular motion on the bench, or in your hand, to form an even ball. Place the balls on a baking tray spaced about 2cm apart, cover with a damp tea towel and allow to rise and expand so the balls are touching - this could take 20 minutes to 40 minutes depending how warm your kitchen is. 8. While the buns are rising, make the cross. Whisk the 120g of flour with 120ml of water to a smooth paste - if it's too sticky add a little more water. Place in a piping bag with a fine nozzle and, once the buns are fully risen, pipe the crosses; it is easier to do this in lines the whole length and width, rather than individually. 9. Bake the buns in a preheated oven at 220 degrees for 10 minutes, then reduce the heat to 200 degrees and cook for another 10 minutes. 10. 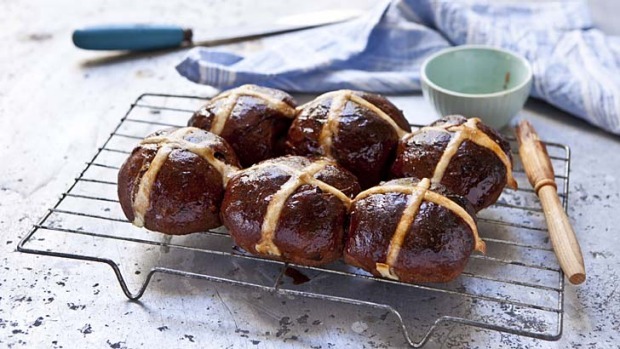 To make a glaze for the buns, add 60g of castor sugar, a teaspoon of mixed spice and 55ml of water to a small pot, bring to the boil and boil for two minutes, then brush over the hot buns. Transfer to a cooling rack. Tip Don't halve this recipe as it doesn't perform well. Just throw extra buns in the freezer or share with your neighbours. Serve with hot cocoa or milky tea.